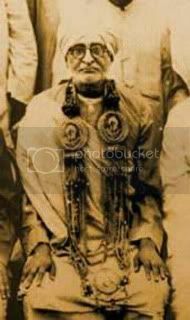 Today is the appearance day of Shrila Bhaktisiddanta Sarasvati Prabhupada, my beloved guru’s spiritual master (my param or grandfather guru). This day corresponds with my desire to speak something about hope, which I have expanded upon to include inspiration and renewal. Some modern thinkers have considered that ordinary hope, is lackluster, or a kind of lazy inaction. Just like we might hope to loose weight, get a promotion, stop smoking, find love, win the lottery, or a host of other things, yet not do anything to increase our changes of obtaining those goals. Most things don’t just drop out of the sky, other than unwelcome meteors, hail, or crashing planes, and we have to make some endeavor or work for them. Although mercy is said to be undeserved, we are still advised to increase our spiritual practice and devotion in order to draw the Lord’s attention to us, and be more likely to attract his mercy. As far as possible we want to do our part, while knowing fully that our ultimate success is totally dependent on the independent mercy of the Supreme Lord and his pure devotees. When the Lord or his great devotees appear in the world, we are reminded of our great good fortune in either meeting them personally, or coming in contact with them in disciplic succession through one of their disciplic descendents or through their books or words. 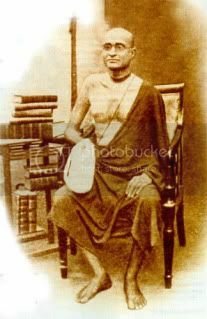 It is said that Shrila Bhaktivinoda Thakur was the pioneer of Gaudiya Vaishnava outreach for the modern world, whereas Bhaktisiddhanta Sarasvati gave it practical shape, and my guru, Shrila Prabhupada, spread it all over the world. As I have shared before, such persons are heroes for those who have taken up the path of Krishna consciousness or Chaitanya Vaishnavism. They bring the light of the spiritual world and encourage us to follow the path they have chalked out and also walk themselves. Though we have little spiritual standing ourselves, we have been inconceivably fortunate to have come in contact with their compassionate well wishing. Such devotees don’t live for any selfish purpose, but to reclaim fallen souls like us. Their anxiety and distress is to see us suffering, which they also feel personally. In heartfelt response, they devise ways to attract us to the message of Godhead which is so nourishing and sustaining to them. They pray to create, or capitalize on existing, “teachable moments” when we will be more receptive to hear that our happiness isn’t found in worldly pursuits, but in loving and serving Krishna, in the land beyond death. When we realize—even to small extent—that our highest prospect is found in the holy name, and in the teachings and association of those who love Krishna, we can’t estimate the rarity of our good fortune. Great religious reformers are always misunderstood by those who don’t have spiritual vision, even though they may be part of the same tradition. The more one takes a strong stand for spiritual ideals, and to correct misrepresentation of current practices, the more agitation and anger is directed toward them. Often those invested—who gain money or power from—the status quo of less than ideal application of Gaudiya Vaishnavism create the most disturbance in response. However, in the three great devotees I mentioned above, they were all great, in part, because they were agents of change and revitalization of the tradition. Such revitalization needs to be done in every generation—in fact, I have experienced personally that I have had to revitalize and rethink my practice of Krishna consciousness many times. Time tends to degrade things—material objects and our spiritual consciousness, if it is not kept vital, alive and relevant to what is important to us. It is said that even great scholars can not understand the activities of pure devotee. Such devotees live the purpose of the scriptures, and make adjustments to craft the scriptural teachings in a way that is accessible to the times they live in. Shrila Bhakitsiddhanta Sarasvati Thakur said that “religion means proper adjustment”. So in every culture the details of practice must be adjusted around the spiritual essence or purpose of life. Those attached to the externals of religion or to stereotyped ideas, are bound to misunderstand dynamic outreach, and bring about their ruin by criticizing such empowered devotees. We find this in the history of the preaching of Bhaktisiddhanta Sarasvati, in our Prabhupada, and in the lives of those following in their footsteps. Thus we have to be very careful in studying the lives of such devotees, seeing their successes as a testimony of their pure intention and insightful adjustments. By studying the lives and teachings of the previous acharyas or teachers, like Shrila Bhaktisiddhanta Sarasvati Thakur and others, we will be better equipped to place Prabhupada, and those coming after him, in the proper context. 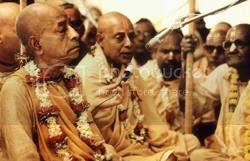 Shrila Prabhupada didn’t appear in a vacuum, but in a disciplic succession coming from Lord Chaitanya—the real yuga acharya and incarnation for this age! Lord Chaitanya is the mystical tree of devotional service, and the different missions such as ISKCON, are various branches from this tree. We see by such careful study of past acharyas, that although they may differ on minor points or make various external adjustments, they agree in terms of the scriptural conclusions (siddhanta) and the purpose of life. Unity in diversity! Do study about Shrila Bhaktisiddhanta Sarasvati Thakur, and think about how our Shrila Prabhupada followed his example and also made adjustments.